Vegas Party slot machine from NetEnt is a 5-reel, video slot with 243 ways to win, that is exclusively available for Leo Vegas customers and so features the Leo Lion logo symbol as well as other classic slot title icons. The game has a maximum jackpot of 1,000 coins per line but no bonus rounds or multipliers, but don’t let that put you off, its still definitely worth a look. The full Vegas Party slot review is below. While most mobile casinos can’t resist boasting about their ability to offer exclusive video slots, more often than not they tend to be underwhelming affairs – thankfully, however, that’s not the case with the Vegas Party slot over at LeoVegas. Specially developed by NetEnt for the popular mobile casino site, the Vegas Party slot machine features 243 ways to win and a bright and colourful theme that instantly draws players into a life of Nevadan luxury. Unique symbols to appear in the game include a golden coin decorated with the Leo Vegas lion, Cleopatra, James Bond, a leprechaun and a pirate, with the action taking place to a Strip backdrop. 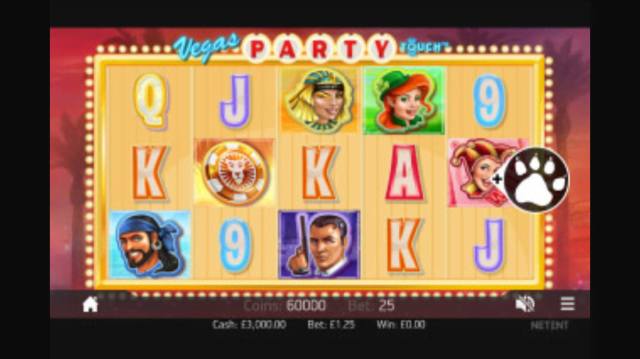 Playable from as little as £0.25 per spin on all desktop, mobile and tablet devices, Vegas Party’s glamorous theme is further enhanced by a funky soundtrack and the presence of wild Joker symbols that substitute for all other icons. Wins are awarded for three identical symbols in any position on adjacent reels from left-to-right, with players able to get their paws on a 1,000x base game jackpot. While not offering players anything in the way of free spins or bonus rounds, every spin in the Vegas Party slot does benefit from NetEnt’s Linked Reels feature, which ensures your next big win is never far away. For those unfamiliar with Linked Reels, this simple gameplay aspect sees two randomly chosen reels become “linked” at the start of each spin, meaning they always display identical icons. For the uninitiated, this might not sound like it would have much of an impact on your base game winnings, but when you consider that these Linked Reels can also expand to fill three, four or even all five columns on the gameboard, the upside is plain for all to see. Over the course of say, 100 spins, you’re virtually guaranteed to land a big win thanks to the slot’s 243 ways to win pay system. While it would have been nice to see NetEnt bolster this offering with a few scatter symbol incentives, the fact is the Linked Reels really deliver and help keep Vegas Party exciting throughout. Although a relatively simple game, the Vegas Party slot manages to deliver a healthy return to players thanks to its 243 ways to win and Linked Reels feature, making it one of the better exclusive slots out there. Like the Vegas Party slot review? Check out these as well…..